The Crocker Art Museum has completed construction of a 125,000-square-foot expansion designed by Gwathmey Siegel Kaufman Architects. Opening to the public on October 10, 2010, the Teel Family Pavilion will more than triple the museum’s current size and enhance its role as a cultural resource for California and the state’s many visitors. One of Gwathmey Siegel Kaufman Architects co-founder Charles Gwathmey’s last major public projects, the Crocker Art Museum expansion complements the 125-year-old museum’s historic structures, which include one of the first purpose-built art museum buildings in the United States. 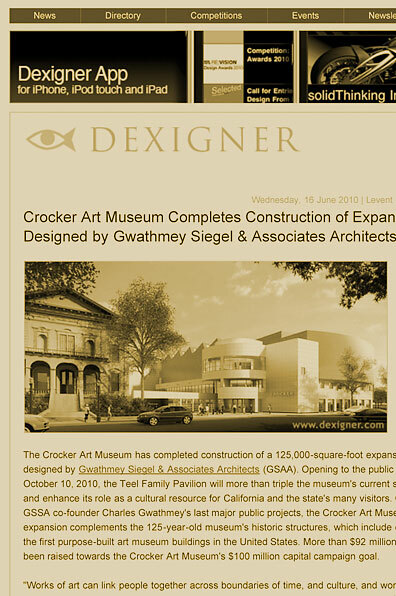 More than $92 million has been raised towards the Crocker Art Museum’s $100 million capital campaign goal.